Seven full days treating endangered Egyptian vultures, flamingos, pea fowl, ibis, an eagle, owls, black kites and fruit bats to name but a few was the 'experience' that final year vet student Ashley got to sample. In the middle of a busy Indian city, Ahmedabad, the Jivdaya Charitable Trust had set up an avian A&E to deal with all the birds injured when entangled in discarded/left over kite sting used during Uttarayan/International Kite Festival. Birds are brought in with awful injuries, such as full thickness wing lacerations not only of the ligament but also the underlying muscle structures and bone fractures as well. Often the wounds are necrotic as the birds will have been entangled for some time before they are found. This requires heavy debridement and intensive treatment. Many don't make it. WVI vets and vet nurses join skilled local vets and other volunteers to lend their expertise and advice to the process. 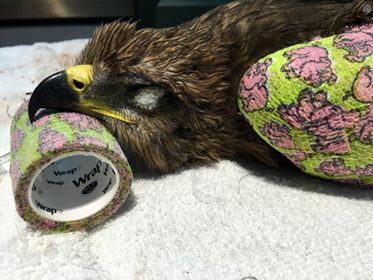 We continue to help JCT refine the surgical process, particularly for birds of prey, to ensure that more birds survive the trauma of their injuries and surgeries and are able to fend for themselves in the wild. Ashley was able to see the light at the end of the tunnel and released some birds that were deemed ready. For more about her experience, please visit her blog Travel Animal Online.